You can download the Manual in Adobe Acrobat PDF format (6.8MB). Alternatively, you can read the whole manual here, as a web page. In this game, you will claim strategic locations, recruit vast armies, learn powerful spells, and through the strength of your might, or the power of magic, vanquish your foes. The winner will be the side remaining when all others have lost their last army and town. Additional objectives are given in the advanced rules. Heroes of Might and Magic is a collectible card and tile game based on Ubisoft’s classic computer game of the same title. Enclosed in this box is a set of 7 map sections, 120 collectible cards, 180 location markers, 72 town markers, 48 army markers, and a 10-sided die. 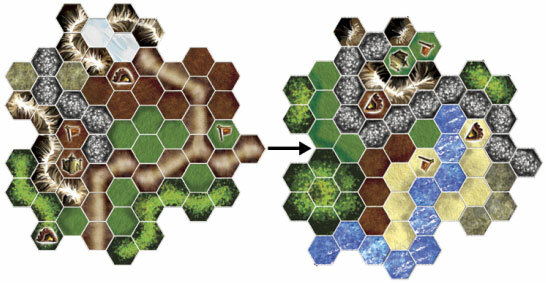 The map sections are interlocking pieces that connect together to form a different game board each time you play. During setup, the players will be instructed to rotate and connect the tiles as they see fit. When doing so, turn them any way you wish, but be sure that the protruding piece from your tile fits snugly into the interlocking notch in the tile you are attaching it to.